Nearly 200 people gathered at the city’s Turning Point UMC to receive free diapers, share in delicious food, upbeat music and fellowship. Last Christmas, The Maker’s Place spearheaded a diaper drive which collected over 90,000 diapers from United Methodist Churches throughout GNJ to be shared with the city’s low-income families with babies. The Diaper Party featured face painting, activities for kids, a mini resource fair for parents, and more information about The Maker’s Place. Reed said that The Maker’s Place is dedicated to building relationships with the people in the community. 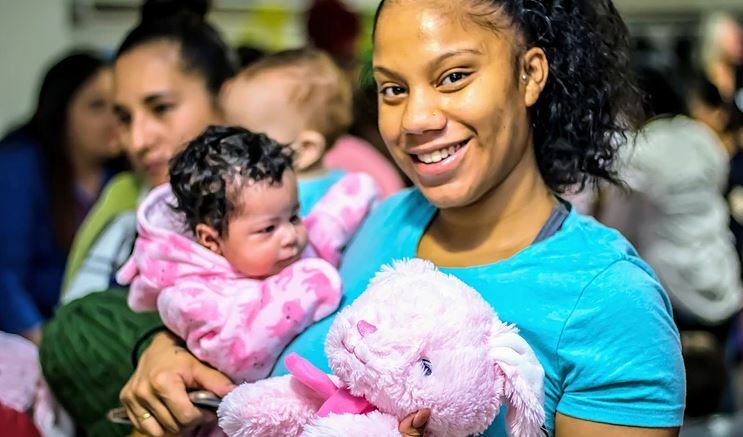 Trenton, which has one of the highest infant mortality rates in the U.S., is on a path toward changing that statistic, in part through the transformative asset-based community development of The Maker’s Place. “We followed our assets, and the aspirations of people living in poverty, to determine our first step into ministry,” said Reed. The Maker’s Place mission is based on the principle of mutuality; pointing to the respect and reciprocity existing in all healthy communities. The Maker’s Place affirms that everyone is made in the image of God and to be a maker means better lives and communities. Volunteers worked the room, introducing themselves and building relationships. A “Maker’s Place Mural” was set up on black canvas paper with the words “Share Your Dreams” written above. Guests, volunteers, pastors, social workers and attendees were invited to take a crayon, trace their hands on the mural and write their hopes and dreams for themselves, their children, and their neighbors. “It’s a powerful way to visualize mutuality and community,” said Reed. When asked what The Maker’s Place was all about, the mural showcased the answer. “We’re a new group in Trenton, and we’re here to do that,” said Reed, pointing to the mural. People were told that The Maker’s Place was committed to more than just giving away diapers but also to add the communities’ gifts and aspirations so every child in Trenton can grow up in a thriving community and so people can experience a life that is “good, abundant, and touched by the love of God,” said Reed. With The Maker’s Place still in its infancy, Reed hopes that it too will grow into the very mission it seeks to accomplish.